Director: John Ford. Cast: Charley Grapewin, Elizabeth Patterson, Marjorie Rambeau, William Tracy, Gene Tierney, Ward Bond, Dana Andrews, Grant Mitchell, Slim Summerville, Spencer Charters, Russell Simpson. Screenplay: Nunnally Johnson (based on the novel by Erskine Caldwell and the play by Jack Kirkland). 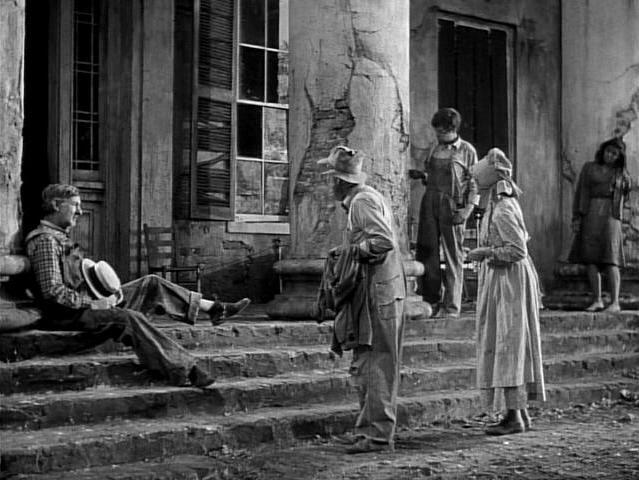 Released within a year after The Grapes of Wrath and The Long Voyage Home and six months before How Green Was My Valley, Tobacco Road is the proudly exuberant idiot sibling of these other John Ford endeavors into stylized regionalisms and cruddy-glossy working-class ethics. Despite its shaky source material and its occasionally overweening fondness for conniption and commotion, the question never inheres around whether it's a "well-made" film. The whole project has spring and vitality, capable at sudden moments of tenderness or contagious joy, moving at a generous clip, and forgoing completely the awestruck, self-reverential tone of so many adaptations of long-running plays in favor of a rude, shambolic vulgarity. All manner of roadside and front-porch and clerk's-office shenanigans unfold with a burlesque aplomb, and if the framings sometimes seem surprisingly unmodified from standard regimes of proscenium blocking, Ford can easily be taken as flaunting the essential, high-calorie vaudevillianism of Tobacco Road, as against the haunted, marrowy, novelistic insights of Grapes or the Serious Theatre trappings of Voyage. Just a bit of aesthetic adjustment, even when it entails some lame-looking shots, goes a long way toward broadcasting a valuable sense of Ford recognizing the material for what it is, and intuiting the only way it could probably cohere on the screen. And it's hardly the case that technique falls casualty to all the broad comedy. As in Valley, Arthur Miller's detailed and grainy cinematography works wonders at evoking the landscape and at pulling out the lines and inflections of character on the faces of a heterogeneous cast, from Charley Grapewin's splashy but wittily articulated peasant-farmer to Elizabeth Patterson's sharp but pliable semi-grimace as his wife to William Tracy's nearly intolerable excess as their shouty son and Gene Tierney's vacuous, dirt-smeared nubility as the daughter who, at 23, might be too old to interest the feckless men of backwoods Georgia. None of this alters the gauche superficiality of the script and the action, as Grapewin and his brood "colorfully" hoodwink and aggravate their neighbors while straining to hold on to their stingy, careworn plot of sub-subsistence farmland. Neither the script nor the direction is always very deft at prioritizing the color or the strain, which is part of why Tobacco Road feels in some passages like a hoplessly mixed bag. A subplot with a pencil-thin-mustached Dana Andrews as a benevolent onetime moneybags who's now as bankrupt as anyone else doesn't do much to advance or deepen the material; if anything, this storyline propels Ford and his collaborators out into the sketchiest promontories of "political" sentimentality, which can be as unnerving as the mile-wide slapstick in other scenes. Plays that stay on the boards as long as Tobacco Road dida fact that the opening title-card is proud to announceare rarely abetted in these long, crowd-pleasing runs by thematic depth or incisive ideology, and though it's fair to hold Ford somewhat accountable for falling prey to his own gummiest, silliest instincts by choosing material this limited (and, from what I read, this heavily redacted), I doubt anyone could have mounted a film of Tobacco Road that made the rudimentary plot and characters really thrive. Almost no other helmer would have embraced and formally dignified its absurdity with as much pizzazz as Ford does, right down to those winning and barely edited scenes of calamitous stunt-driving, and no other director's body of work could have endowed the motifs and the prevailing atmospherefacetious and sometimes self-mocking, but without any corrosive cynicismwith as much interest. How can we not think of the travelin' Joads when we see the repeated shots of old jalopies and dusty intersections, or when Tierney admires her smudgy face in the reflecting hood of a car in a shot that looks just like Ma Joad stealing a final glimpse of herself with her prize earrings before packing them in and heading out west?